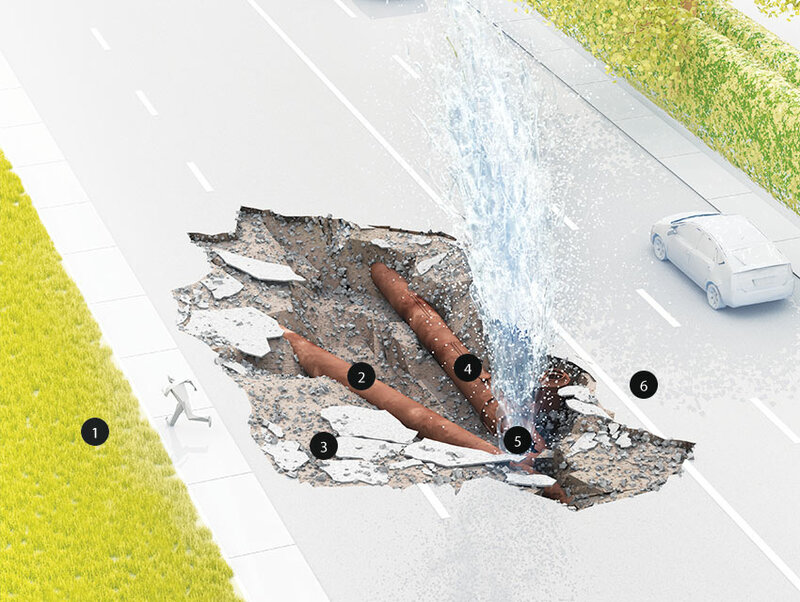 On July 29 an LADWP pipe running beneath Sunset Boulevard ruptured, spewing 28 million gallons of water onto the UCLA campus. The tear in the metal was blamed on corrosion and an existing design flaw. The media described the event as a water main break, which is something of a misnomer. The pipe gushing that summer afternoon was a 30-inch trunk line—the backbone of the LADWP system—installed in 1921 to ferry water to a growing Westside population. Water mains are smaller distribution lines and the culprits in the recent West Hollywood and Hollywood incidents. Here’s what’s bubbling below our feet. The LADWP maintains 421 pressure-reducing stations along 465 square miles of pipe. Pressure along the Sunset line measures 220 pounds per square inch. The majority of the pipes are made of cast iron; the rest, ductile iron or steel. On average the utility replaces pipe in 2,000-foot segments. A four-and-a-half-year project in the Valley that’s scheduled to wrap in 2017 is putting down 6,000 feet of new pipe. The utility tests the dirt around pipes to determine whether it’s “hot”—high in corrosive materials. As a protective measure, the LADWP installed magnesium bars, called sacrificial anodes, to draw away corrosive elements from the repaired pipe. To stop the pouring water, the utility had to coordinate seven large valve closures along the lines, a multistep process necessary to prevent another rupture. The shutdown took almost five hours. During repairs, welders installed a so-called crotch plate made of steel, which reduces flexing of the juncture as the ground moves; this technology was unavailable in the 1920s. Crews worked nonstop for almost six days, welding on-site and mixing in replacement soil in stages so that it would be properly compacted by the time the street was repaved. The July rupture occurred at the top of the pipe where it joins a 36-inch line laid in 1931. Another major break, along the 1914 Coldwater trunk line in the San Fernando Valley in 2009, caused less flooding because the split was at the bottom of the pipe.